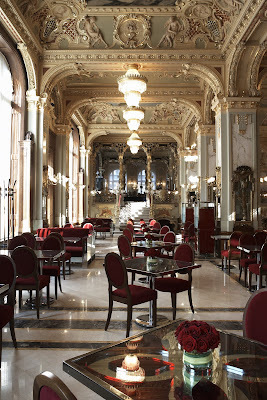 When it opened in 1894, the New York Palace was home to a coffeehouse reputed to be ‘the most beautiful cafe in the world’ and a renowned centre for Budapest literary life. Fast-forward a century or so, and the building was a sorry sight, devastated by war and regimes not interested in aesthetics. The Boscolo Group acquired the building in 2001 for €2.5 million and has invested a further €80 million in extensive renovation. In May 2007, after a five-year restoration effort, overseen by Maurizio Papiri, Ádám Tihány and the lighting designer Ingo Maurer, the Boscolo Group, a small yet sophisticated Italian hotel chain, reopened the ‘palace’ as Budapest's latest luxury lodgings: a clear attempt at unseating the five-star monarch, the Four Seasons Gresham Palace. Writers, artists and intellectuals flooded in and gazed around at the opulence, hoping for literary inspiration. At the re-opening of the legendary watering hole, Pest district VII mayor György Hunvald said it signified a 'turning point' for the district. Those with an interest in architecture, Hungarian history or literary coffee houses can sit, sip a coffee in the legendary kávéház (coffee house) and admire the sensitive restoration work on the ceiling murals, and the freshly gilded marble columns of the historic coffee house. The ceiling tableaux, depicting muses, have been carefully restored to their former glory while respecting the original colours and technology of the period. In the ‘ladies room’ the gilding of the stucco is a sight worth powdering one's nose for. The gorgeous 112-year-old building, which was a legendary meeting place for the Pest artistic world, later functioned as a sports equipment shop and an Ibusz office. The investors, the Italian Boscolo group hoped to recreate the turn-of-the-century ambience with a luxury, five-star, 180-room hotel and coffee house. The new building occupies the site of New York Palace and the demolished former Athenaeum Nyomda (Printing House) on Osvát utca behind the New York Palace. At the turn of the last century, Budapest was known as the ‘City of 500 Cafes’One of the grandest of these was the New York Kávéház (Coffee House) standing at Erzsébet körút 9-11, near Blaha Lujza tér in the heart of Pest. The New York Palace was built in 1894, to plans by Alajos Hauszmann, as a showcase for the New York Insurance Company. The Gresham Palace (soon to open as the Four Seasons Gresham Palace) and the Adria Palace (now Le Meridian Budapest Hotel) were also built for insurance companies. It's interesting how the dullest jobs get the most gorgeous locations. The building was designed by Alajos Hauszmann, and built by Flóris Korb and Kálmán Giergl in an Italian Renaissance style with eclectic ornate elements. The frescos in the corridors and rooms were created by Gusztáv Magyar-Mannheimer, Ferenc Eisenhut and the celebrated artist Károly Lotz.Locals were struck by the interior’s resemblance to the Bayern King Lajos II’s palace. Inside were the insurance company’s offices (their motto at the end of the 19th century was ‘the best of everything’), and the ground floor was rented out as the New York Cafe. The New York was concocted in a spectacular melange of styles with curly gilded marble columns, bronze details, colourful murals and ornate chandeliers. It immediately attracted Budapest’s literary society; authors, poets, journalists, intellectuals and Bohemians all filled its tables. The artists and intellectuals would sit at their appointed alcove tables while visitors were relegated to the ‘deep end’ (the mélyvíz), a lower floor surrounded by galleries on the ground floor, thus resembling an indoor swimming pool. Impoverished writers could linger all day over the special ‘writers’ dish’ a bargain-priced plate of bread, cheese and salami. Regulars were even provided with pens, paper and unlimited ‘fekete leves’ (‘black soup’ the local term for coffee) and spend entire days within the inspirational walls, ruminating over a manuscript. The maitre d’ during the period, Gyula Reisz, known to all as the ‘literary head waiter’ gave endless credit for his select literary guests. Like Gyôzô Mészáros at the Centrál Coffee House in Pest's district V, he was not a great businessman, but he earned his place in Hungarian literary history. Dr Miksa Arányi was the Hungarian representative of the New York Insurance Company. The first leaser of the coffee house was Sándor Steuer, who was a member of a large cafe house family dynasty. The grand opening was held on October 23, 1894 in time for the excitement of the Millennium celebrations in 1896.The coffee house’s literary scene really blossomed when the Harsányi brothers took over the management. Lajos Nagy remembered the literary atmosphere in his work ‘Budapest nagykávéház’. He wrote, “There are some guests who do their books here, some who write verse, some sell their books, look for a job or churn out articles”. It must have been pleasant to while away the afternoon in the spacious rooms, among the curly columns, winding staircases, and statues. There were two game rooms, one decorated in Rococo style, the other in Renaissance. The gigantic glass separating walls were painted by Gedeon Walther in different styles; with Japanese, Turkish, Baroque, Pompeii and Renaissance elements. The tables and chairs were bronze and the game rooms’ furniture was made from wood. The tasteful light fittings were a special attraction and unique to the New York. The New York can be considered the birthplace of modern Hungarian literature. Almost immediately after opening in 1894, the Pesti Napló editorial moved in. Writers Sándor Bródy, Endre Nagy and Simon Kemény set up their regular tables alongside luminaries from the film world, including the young Sándor Korda and his associates. Actors, journalists and aspiring writers all gathered to soak up the atmosphere and browse through the impressive collection of some 400 periodicals and papers which arrived regularly.In 1908, the legendary literary journal ‘Nyugat’ set up home here, and Magyar Hírlap also operated from one of the offices on the floors above. Regular visitors were Kálmán Mikszáth, Endre Ady, Gyula Krúdy.Zsigmond Móricz came here to seek out the editor of Nyugat, Ernő Osvát, always to be found at his table in the gallery. Ferenc Molnár wrote most of his great work ‘Liliom’ here. Soon after the coffee house opened, legend states that Molnár hurled the main door key to the New York Café into the Danube saying that it should never close. However, one day it was forced to close for renovations. The cafe flourished until the First World War, enjoyed a brief revival in the thirties, and then went into decline. It suffered significant bomb damage during the Second World War and was ignominiously rammed by a Russian tank during the 1956 Uprising. In the 1950s, the New York was turned into a sports equipment shop and an Ibusz office, then, after closing in the late 1990’s, its blackened exterior was shrouded in protective sheets and wooden scaffolding for years, with only the spire soaring unhindered skywards. During the Socialist period, the café was renamed the Hungária kávéház, and was famous for the slowest and most surly staff in town. 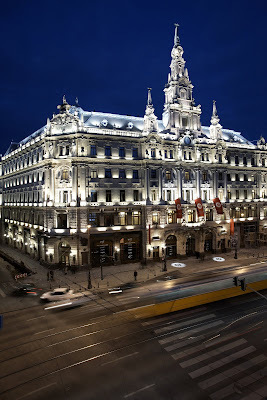 Now it sits on the regenerating Nagykörút (Grand Boulevard), just along from the newly-refurbished Corinthia Grand Royal Hotel, and urges the progress of the great revival.